Welcome aboard the U.S.S. Enterprise D! Join the officers of the galaxy class starship and make it official with the Star Trek The Next Generation Command Polo. 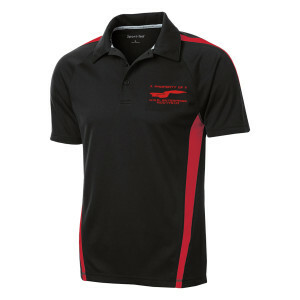 The black polo with Command Red striping features an embroidered silhouette of the Starship Enterprise D along with “Property of U.S.S. Enterprise NCC-1701-D”. This polo shirt in your collection is the perfect identifier of a true fan. I ordered the shirt on sale, but did pay extra for shipping because I wanted to wear it to the Star Trek set in Ticonderoga, NY a few days later. The size that I ordered was a large, and it fits perfectly. The material feels great and since it'sa short sleeve shirt, I won't be wearing it again until next summer. Waited until on sale. Enjoyed it many lots. Looks great with red long sleeved t-shirt underneath. It looks great on my hubby. He loves it. I'm happy I got it for him. Fits good on him. My hubby loves this shirt! He will be wearing it when we go on the Star Trek Cruise in January! Great vibrant colors - the red racing stripe rocks. Love it.